Yes, I’m still enjoying bacon. I wonder if I’ll be sick of it in a few days? I had a delicious bunless burger with cheese, bacon, onions and a wee bit of BBQ sauce, and a few vodka sodas with friends. So, in three days, I’m down 3 pounds! Don’t start taking my glory by shouting “it’s water weight” because I DON’T CARE! I’m eating things I haven’t had in ages and I’m losing weight. Bring on the ranch dressing. Hell, I’m gonna dip my bacon in ranch dressing with a side of butter. All right, I joke. Sorta. Yesterday was my first day, and I’m trying to keep my carb intake under 30. It wasn’t hard. I’m eating bacon. “I’m a bacon-aterian”, as my son once announced when he was about 4. I’m taking that idea, and I’m running with it. 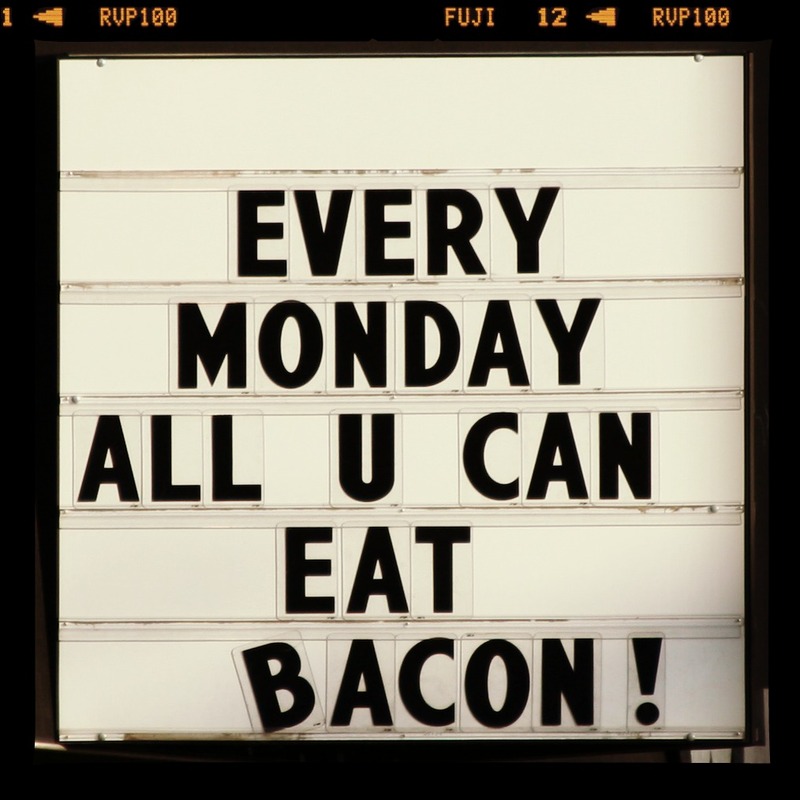 I mean, for gosh sakes, who wouldn’t want to be a bacon-aterian. The hardest part though, is getting over my fear of fat. No, I’m not scared of myself, but I’m sort of balking (okay I ate about 8 pieces of bacon yesterday) but in my head, I’m balking at ingesting fat. It seems so counter-intuitive. I will go have my blood work done soon just to be sure I’m not absolutely freaking my numbers out. The research says my numbers will get better, but well, (*blush*) they’re already good! Except that blasted scale number, that one’s still bad. Anyone out there on a LCHF stint? Can you please chime in here? Tell me how great you’re doing with full fat cream, lots of butter and sour cream by the spoonful… please? Hitting Balls! And, It Feels So Good! Last week I realized that it had been almost a year, an ENTIRE freaking YEAR, since I’ve last played a tennis match. My last match was in May of 2014, so 10 months. I was 30+ pounds heavier then too, and feeling miserable about my body, and that’s not even counting my knee pain. So, I waited 3 months for surgery because I had to take several trips and get the son off to college. End of August I finally had surgery. We were hoping for a 3 month recovery, but it’s been more than 6. The last two times I hit balls, it hurt. I couldn’t walk the next day, and totally and completely sucked. Finally, a beautiful day and NO pain! But guess what?? Sunday afternoon, I hit balls, even ran for some. I served, volleyed and hit hard groundies. Oh my good golly gosh, it felt so good! THERE WAS NO PAIN!!! People were walking by the court saying, “Oh my gosh is that you? 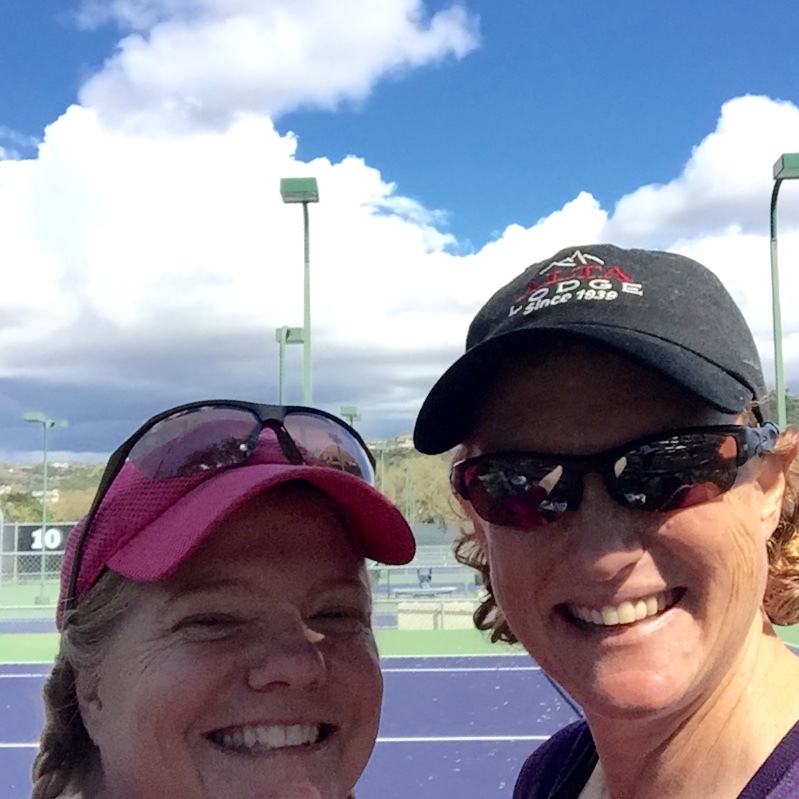 I can’t believe you’re here finally!” I’m so grateful for my buddy Wendy for offering to hit with me even after she’d already played a match that morning. Made my year, that did. I even hiked the next morning with minimal soreness. My fingers are crossed that I can get a doubles practice match in before the season kicks in!! Hurry up Saturday! Christmas pounds I gained, left to lose. Sigh. 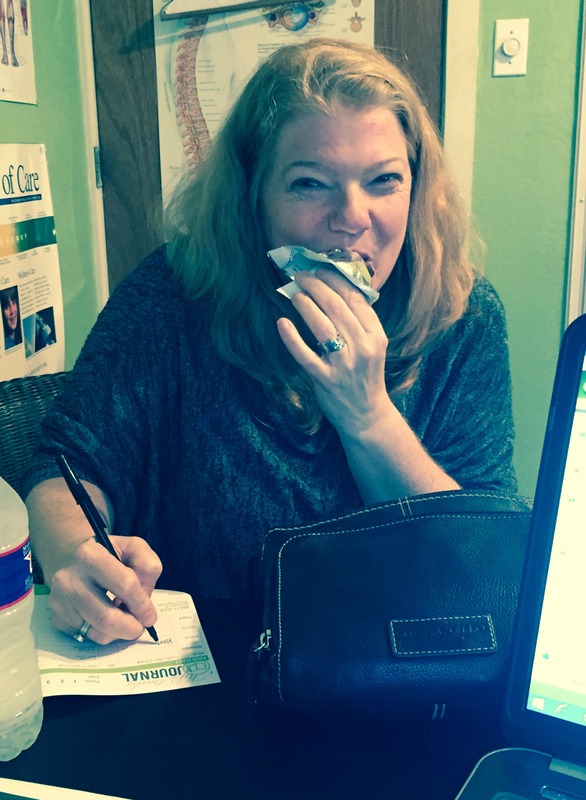 So, she snapped a photo of me in her office, eating a protein bar and actually writing it down. I admit, writing it down helps. So, I started out being good. You know what they say about “good intentions” and the road to hell and all that? So, my intentions are there. Really! I’ve written everything down, and guess what? Yep, that furry little animal with the fluffy tail, and/or the shiny something that caught my eye, well, yes, that distraction happened! It was a good distraction though. Does that count as part of my “being good” this week? Our 8th wedding anniversary happened! That’s a fine and very good thing. 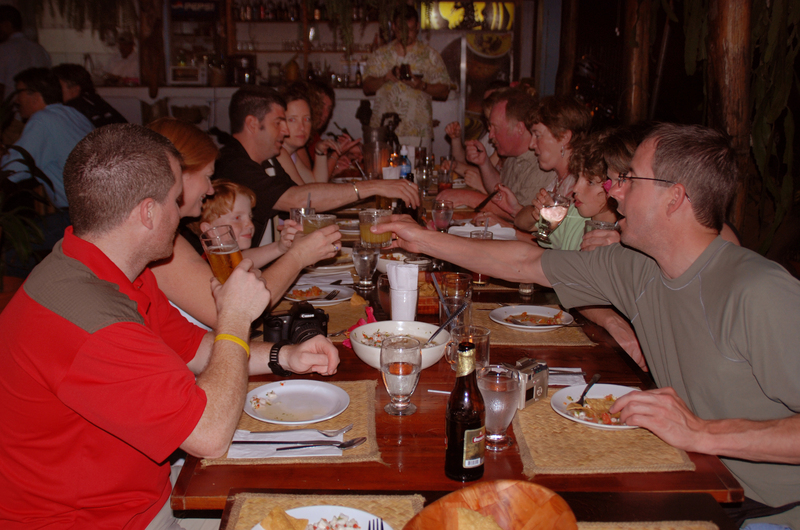 We celebrated a day early, you know, to reminisce about the lovely rehearsal dinner in Costa Rica with our friends and family. Yes, we went out to celebrate our rehearsal dinner. Why not? It was a lovely night 8 years ago! So, away we went, braving the madness that is South By Southwest happening right now in our town, to this meal at the Four Seasons. This particular celebratory meal, included a starter, drinks, main course, a couple of sides (one of them was a vegetable, in my defense. Brussels Sprouts… flash fried, but a veggie nonetheless) and a tower of doughnuts, piping hot with special sauce and ice cream. They also brought a plate of bon bons on the house with “Happy Anniversary” scripted in chocolate down the plate. I indulged, okay, over-indulged and enjoyed my favorite company, my lovely hubs. The food was not spectacular despite it’s spectacularly stupid price, and we both were underwhelmed. However, the company was perfect. Then, on the anniversary of our actual wedding day, we decided to head out again. We are worth a two night binge. We are! This time, we were not disappointed with our local fare at Jack Allen’s kitchen. We started at the bar for our hour wait, where we met a lovely couple from Santa Cruz, California. While we were chatting, I realized that the hubby and I had picked out my engagement ring in Santa Cruz over 11 years ago! How serendipitous was that? They were about to celebrate their 48th anniversary, and I loved her still strong New York accent when she said, “Before you know it, you’ll be celebrating 48 too!” I’ll be well into my 80s by then, and I have no doubt, we’ll be celebrating then too! Our meal was less than 1/3 the price of our rehearsal meal the night before and about a thousand times better. I exaggerate not. The steak was perfection, the salmon delicious and the drinks and dessert, well worth eating. The company was still the best part of the meal, but we learned our lesson. The Four Season’s just can’t keep up with native Austin cuisine. Lesson learned! So, though my good intentions got lost in my good times, my heart is full and happy. Belly too. 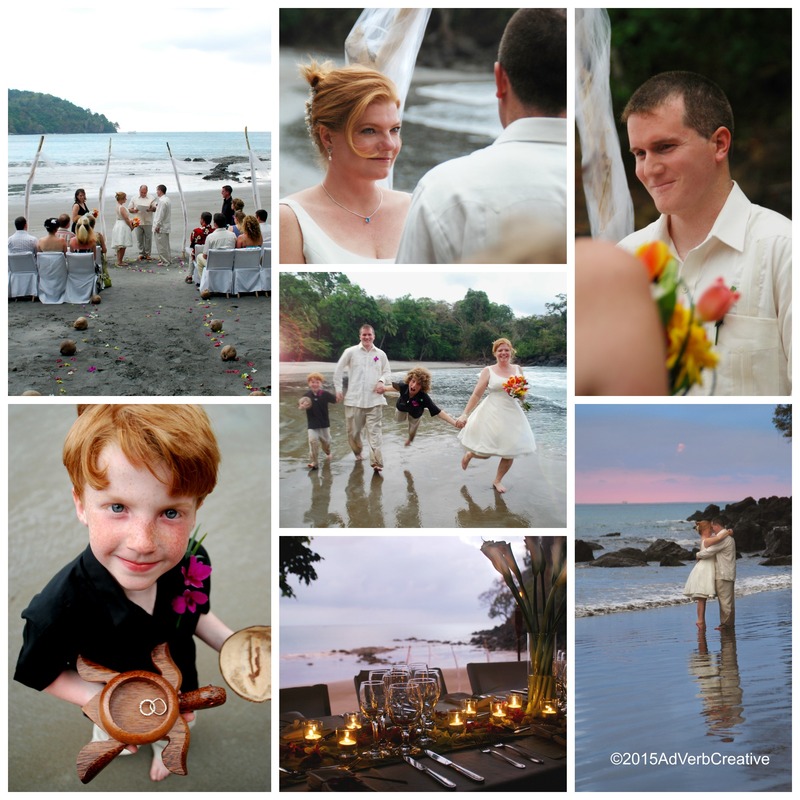 Besides, who wouldn’t want to celebrate our beautiful Costa Rican beach wedding / jungle reception again and again. Magical Costa Rican Wedding. Definitely worth celebrating over and over!! I’m a lucky, lucky girl. My diet can restart now.